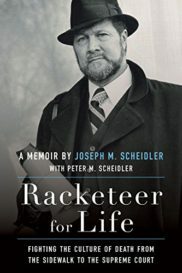 Racketeer for Life: Fighting the Culture of Death from the Sidewalk to the Supreme Court by Joseph M. Scheidler with Peter M. Scheidler (Charlotte, N.C.: TAN Books, 2016). There is much in Emerson’s philosophy that is untrue and even harmful, but on this point, he is absolutely right. To understand any movement, one needs to look to the lives of that movement’s leaders. On a higher plane, consider for a moment how much of Scripture is biography—Adam, Abraham, Jacob, David. The Holy Gospels are to a very large extent the biography of Our Lord. Butler’s Lives of the Saints has been a literary staple in Catholic homes for centuries. The pro-life movement that took shape around the time of the 1973 U.S. Supreme Court’s disastrous Roe v. Wade decision is a case in point. 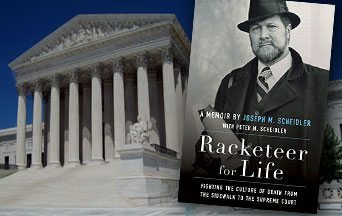 In his book, Racketeer for Life: Fighting the Culture of Death from the Sidewalk to the Supreme Court, one of that movement’s founders, Joseph M. Scheidler recounts a life spent fighting against the culture of death. Yes, this book is an autobiography—but it is much more than that. Aided by his son, Peter Scheidler, it is the history of a legal struggle that has been fought out in the courts for over four decades. It is a book about the malleable nature of our political system. It is a horror story of a most intimate kind. Although Mr. Scheidler is too modest to say it in so many words, he has spent a life following the example of those angels. It has been a difficult life, as all such lives are. There have been small-scale betrayals—as when he was fired from an agency he helped found because its board thought him too extreme. There were betrayals on a much larger scale as well as in Justice Sandra Day O’Connor’s betrayal of the trust of the pro-lifers who supported her rise to the Supreme Court. Of course, much of the story is to be found in the various reactions to Mr. Scheidler’s work. He gives his wife, Ann, abundant credit for her rock-like support of him. We can also view the tepid “support” of John Cardinal Cody of Chicago as well as the distinctly untepid reactions of the organizations that continue to support the idea that a mother has the “right” to kill her child. One is horrified at the statements of the “Religious Coalition for Abortion Rights” trying to make something sacred out of this most un-holy act. Much of the book centers around N.O.W. v. Scheidler, in which the National Organization for Women tried to have Mr. Scheidler branded a racketeer under the RICO statutes. This blatant miscarriage of justice eventually went all the way to the Supreme Court where Mr. Scheidler was exonerated. All-in-all, the book makes for arresting reading. Those who have fought the pro-life battles since the 1970s will find reassurance that the right will eventually prevail. Younger readers will find an inspiring tale of the power of the truth when it is diligently pursued. All will be uplifted. 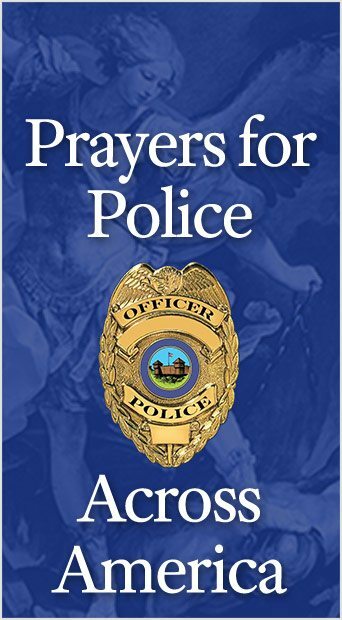 This entry was posted in In Defense of the Unborn, TFP Recommends Books and tagged angel, autobiography, culture of death, exonerate, fight Satan, in defense of the unborn, Joseph M. Scheidler, leadership, memoir, power of the truth, pro-life, Pro-Life Action League, Racketeer for Life, role model, Role of True Catholics by Edwin Benson. Bookmark the permalink.